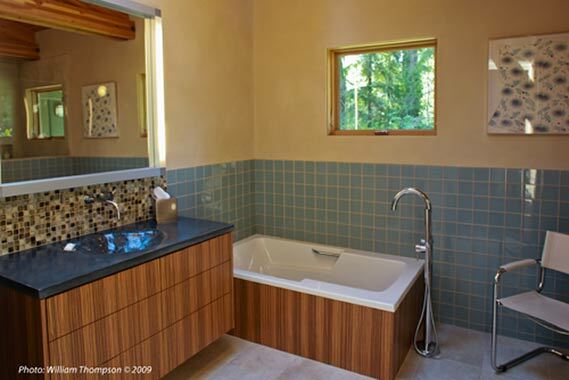 Generously proportioned and sustainably built, this master bathroom provides room for two during the early morning rush to get out the door. A hat box style installation on the air jet tub along with built-in grab bars makes for ergonomic access to the tub and floor mounted roman tub filler by Graff. The wall mounted cabinetry in vertical book matched Zebrano give the room an airy, uncluttered feel. The custom cabinetry is outfitted with touch latches, drawers and doors pop open with a gentle nudge. 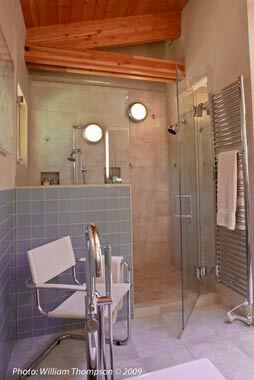 The shower sized for two bathers has two shower heads controlled by two separate thermostatic valves (hidden behind the half wall), a full width bench under the window, wet rated lighting and frameless glass. To add a touch of luxury, a heated towel bar is within easy reach of both the shower and the tub. Glass tile wainscoting adds a punch of color to the overall neutral pallet while the custom concrete counter with integral sink provides texture.